One of the most important uses of a network is for file sharing purposes. There are multiple ways Linux and Windows, Mac OS X users on a network can now share files with each other and in this post, we shall cover Nitroshare, a cross-platform, open-source and easy-to-use application for sharing files across a local network. Nitroshare tremendously simplifies file sharing on a local network, once installed, it integrates with the operating system seamlessly. 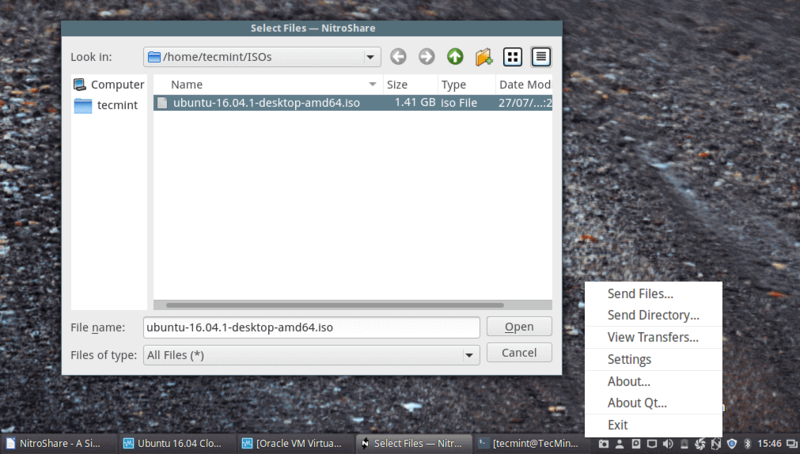 On Ubuntu, simply open it from the applications indicator, and on Windows, check it in the system tray. Additionally, it automatically detects every other device on a network that has Nitroshare installed thereby enabling a user to easily transfer files from one machine to another by selecting which device to transfer to. 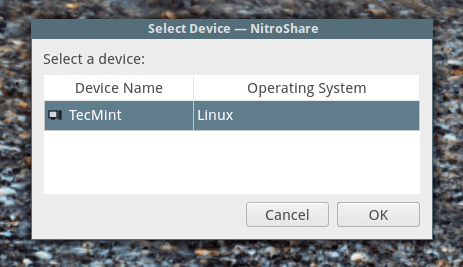 NitroShare is developed to run on a wide variety of modern Linux distributions and desktop environments. NitroShare is included in the Debian and Ubuntu software repositories and can be easily installed with the following command. Note: As I had already mentioned earlier on, all other machines that you wish to share files with on the local network must have Nitroshare installed and running. After successfully installing it, search for Nitroshare in the system dash or system menu and launch it. After selecting the files, click on “Open” to proceed to choosing the destination device as in the image below. Select the device and click “Ok” that is if you have any devices running Nitroshare on the local network. From the NitroShare settings – General tab, you can add the device name, set default downloads location and in Advance settings you can set port, buffer, timeout, etc. only if you needed. That’s it for now, if you have any issues regarding Nitroshare, you can share with us using our comment section below. 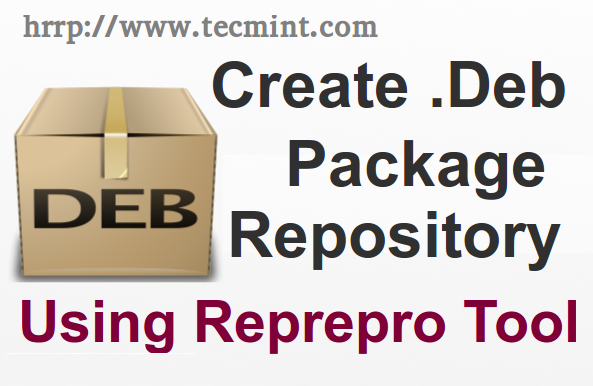 You can as well make suggestions and let us know of any wonderful, cross-platform file sharing applications out there that we probably have no idea about and always remember to stay connected to Tecmint. Has anyone had a case where after installing, you cannot right click the left most pane of the file manager in Windows 10. The software worked great and was able to send files between Windows 10 and Antergos but I noticed that my right click stop working in file manager (Whenever I would right click in the left most pane, it would clock for a second and state no response on the title bar of the file manager and then completely close/crash file manager… was able to right click in the right pane but not left). I know that this was tied to Nitroshare as it was the last app installed and once I removed NItroshare, I was able to start right clicking again in the left most pane. Added as an issue to the git page (just wanted to see if anyone else has seen this issue. 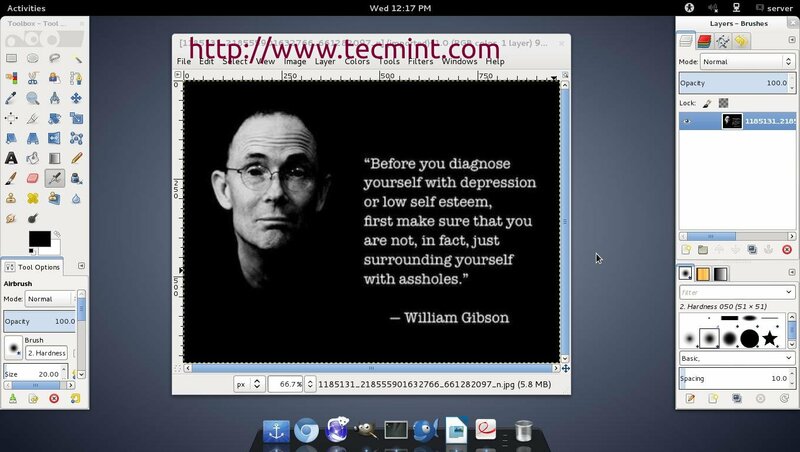 Many thanks for sharing this with us, on Linux operating systems(Ubuntu, Linux Mint and CentOS ), i did not experience such. You must open two ports on each machine 40816 and 40818. Unfortunately I haven’t been able to get it to work with VMware workstation 12 using Windows 10 as the host and Windows 7 as the guest. Works fine between Windows 10 hosts though. I haven’t tested with VMware workstations, yes but I do tested with VirtualBox guest (Linux Mint 18) with my Ubuntu 16.04, worked great for me..
Do you know what this ‘nitroshare’ is and how it works? That has been described fully in the article, you can read carefully around the introductory parts to answer your question.